Snapper Canal is a multiplayer stage in Splatoon 2. Snapper Canal is an urban river canal running under a train bridge. The defining feature of the stage is the two large sloped surfaces that descend down from the outer portion of the map to the lower area near the water. The Spawn points are located on elevated platforms that protrude outwards allowing players to access the right side of the map easily. Immediately in front there is a small flat area before the canal descends to the lower point. Players can however take a corridor to the left which will get them to the other side of a wall and to the other side of the slope. To the far sides of each map, the lowest flat areas can be found with some obstacles and a ramp only accessible from the lower area. The center of the map has a large lone barricade, the wall can be inked but the top of it is uninkable. The Splat Zone is located at the very center of the map on the low area with the barricade. The map is completely unchanged in this mode. The Tower is located at the center of the map in place of the barricade. The tower will retreat back towards your base and go left before going forwards over the water towards the enemy base and reaching its final destination on the flat area at the top of the slope in front of their base. Inkrails have been added in front of spawn to facilitate getting into the fight faster. The first checkpoint is located at opposing ends of the central lower platform. The second checkpoint is located after the tower has retreated and gone left, before it changes directions and heads over the water towards the enemy base. The third checkpoint is located immediately after the tower has cleared the water. The Rainmaker will be located on top of the barricade at the center of the stage. The goal is located where each team's Spawn point would usually be, ramps having been added to facilitate this. The Spawn Points have been moved one layer up on a newly added platform. Players can take a more direct approach to the area, can access some newly added inkable walls up the left side of the map or infiltrate from the right side. The baskets are located in the flat area in front of spawn. The map is relatively unchanged barring the addition of a Inkrail that goes over the water canal designed to be another path to reach the opposing team's basket. The stage was released on 6 October 2017 at 14:00 UTC. Fixed an issue on Snapper Canal allowing players to repeatedly cross over squid barriers near spawn points. Fixed an issue on Snapper Canal causing players to walk faster on slopes inked in opponents’ ink than originally designed. Fixed an issue on Manta Maria and Snapper Canal where the “DON’T RETREAT!” warning in Rain Maker was not displaying when players returned to their spawn point. Fixed an issue on Snapper Canal in which bombs would disappear without exploding when coming into contact with certain walls. Fixed an issue on Snapper Canal in which, depending on the mode, the area beneath obstacles placed near the center was inkable, was counted as part of the turf, and couldn’t be reclaimed in Splat Zones. Outside of Splatfests, reduced brightness of the sun, and reduced the disparity in visibility between teams. 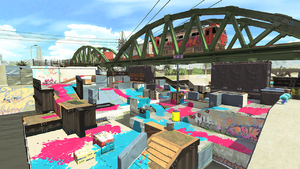 Fixed an issue on Snapper Canal in Turf War in which players could ink beneath certain obstacles and get points for it. A screenshot of the stage with incomplete texture work, found in the game's data. The stage name is a reference to the family Lutjanidae, known as snapper fish. The internal codename for this stage in the game files is "Kawa", from the Japanese 川 (かわ), "River". Pearl said that her dad taught her how to ride a bike as a kid here, but according to Marina, she still uses training wheels. It is stated that Snapper Canal was already under construction when Pearl was a child and is still ongoing, implying its construction has lasted at least twenty years. This page has been accessed 17,568 times.